Carved in a wide variety of woods and artistic styles, Simon Lefrançois' renditions of fauna demonstrate a good deal of fantasy and humor, expressing his individual perspective on animal life. 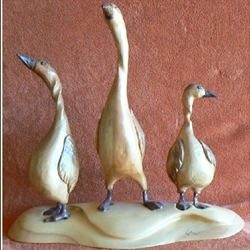 The three-dimensional wood sculptures are carved in maple or in pine, mounted on bases fashioned from cherry wood, oak, birch, pine or ash. The main materials in the wood-and-metal pieces are brushed metal, steel, or another metal - combined with cedar, pine, cherry wood, larch or walnut. They are mounted on bases made from maple, ash, oak, wild cherry, cedar or steel.